The name King is frequently found in Tennessee records from the early 1800's. Our earliest known King ancestor is Albert King. About 1872-1873 Albert and Martha moved from Tennessee to North Carolina. Albert King worked as a mica miner; the family was poor and seems to have moved quite frequently within Mitchell County, present- day Avery County, and adjacent counties in eastern Tennessee. On the 1880 Mitchell County census they are shown in Bakersville township, while on the 1900 Mitchell census they are listed in Toe River township. Martha King died on May 11, 1905 and was buried in Pitman Cemetery on Henson's Creek, Avery County. On December 11, 1906 Albert King remarried Hattie Huskins, age 36, in Mitchell County. Albert died on December 27, 1908 and was buried next to Martha in Pitman Cemetery. mother of 12 children, 7 of whom survived childhood. Only 5 children (William, Nancy, Catherine, Jeff, and John) are ever shown with the couple on census records; it is unknown where the other two daughters spent their childhood. Married George W. Woody. Both George and Alice King Woody are buried in Pitman Cemetery, Avery Co. According to daughter Mamie's birth certificate, Alice King was born in Johnson City, TN in 1873. Alice King Woody had at least 9 children. Children of George and Alice King Woody include: Albert Wiley Woody (July 3, 1887- March 1, 1975), married 1st) Elsie Stamey 2nd) Minnie Grindstaff, the former wife of Jeff Milton King; Mamie Ruth Woody, b. Jan. 3, 1907; Paul Edward Woody, b. May 23, 1905; Joseph Woody, b. July 20, 1915. Married 1st) Tennie McKinney (d. June 10, 1902). She was the daughter of Willaim McKinney and Almenia Hoppes. Children include: Molly King, b. March 1897; a daughter born Aug. 1899; Ader King (June 9, 1902- Nov. 27, 1954), m. Grayson Woody. Married 2nd) Maggie Huskins (1883- 1957). Children include: Pearl Huskins King, b. May 9, 1915; Tessie Lee King, b. March 21, 1918; Ernest W. King (March 21, 1921- December 22, 1962), m. Daphne Gillespie. 3. NANCY KING (b. 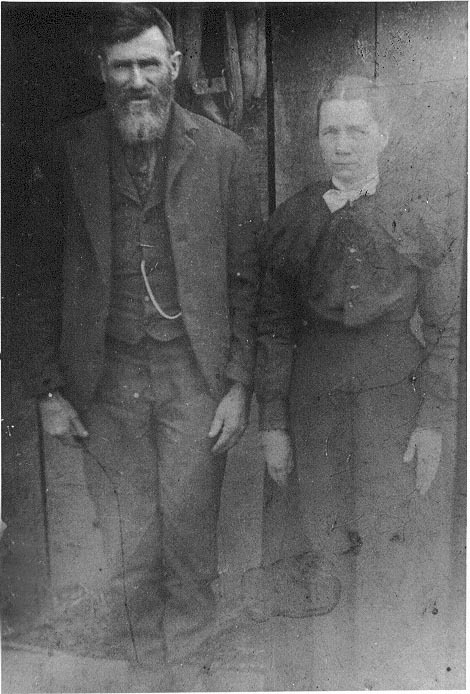 May 1874) married Thad Braswell in Mitchell County in March 1902. He was the son of Slight Braswell, Sr.
4. CATHERINE “KATIE” KING (1876- 1920) married Edward Love in Mitchell County. Both Ed and Katie King Love are buried in Berry Chapel Cemetery, Mitchell Co. Katie may have died in childbirth: she gave birth to a stillborn son on June 15, 1920. In 1921 Ed Love remarried Ida May Howell. Children of Edward and Katie King Love include: Horace L. Love (March 29, 1896- July 31, 1961), married Maggie Huskins; Charlie Love, 1901- 1918; Hobert Love, 1905- 1918; Gladys Love, b. May 25, 1912 , m. Everett Swanner. 5. AUGUSTA “GUSTIE” KING born May 18, 1877 in TN, died November 1, 1940. She apparently died in McDowell County and is buried in Yellow Mt. Cem., Avery Co, NC. She was married to John Paul Blackburn April 30, 1896 in Mitchell Co, NC by T. D. Vance, J. P. He was the son of Spencer Blackburn and Nancy Goforth. (a) Preston Blackburn, born January 15, 1896 in Mitchell Co, NC; died May 1, 1952. Buried Yellow Mt. Cem., Avery Co, NC. (b) Arthur Blackburn, born June 18, 1899 in Mitchell Co, NC; died October 31, 1963. Buried Bear Creek Cem., Mitchell Co, NC. He was married to Dollie J. Duncan December 8, 1927 in Mitchell Co, NC by R. B. Turner, J. P.
(c) Nellie Blackburn, born March 25, 1901; died November 1, 1985. Buried Pine Branch Baptist Church Cem., Mitchell Co, NC. She was married to Roscoe Buchanan July 3, 1920 in Avery Co, NC by D. Buchanan, J. P.
(d) Clifton R Blackburn, born March 26, 1903 in Mitchell Co, NC. He married Jennie Emma Jones. (e) Pearl K. Blackburn, born April 5, 1905 in Mitchell Co, NC; died July 9, 1992. Buried Yellow Mt. Cem., Avery Co, NC. ( f) Arnold Blackburn, born June 11, 1907 in Mitchell Co, NC; died November 10, 1978. Buried Bear Creek Cem., Mitchell Co, NC. He married Julia Snyder. (g) Jack Carrol Blackburn, born March 11, 1910 in Mitchell Co, NC; died October 12, 1968. Buried Bear Creek Cem., Mitchell Co, NC. He was married to Alma McCourry October 31, 1936 in Mitchell Co, NC by C. A. Buchanan, Minister. (h) Lawrence Blackburn, born abt. 1913 in Avery Co, NC. (i) Joseph Paul Blackburn, born abt. 1917 in Avery Co, NC. He was married to Valorie Buchanan July 11, 1936 in Mitchell Co, NC by Clarence Buchanan, Minister. (j) Ruby Jane Blackburn, born October 18, 1920 in Avery Co, NC; died April 22, 1994. She married Ed A. Greene. (k) Florence Blackburn. She married a Buchanan. 6. JEFFERSON MILTON KING (May 26, 1880- January 17, 1955) married Minnie Grindstaff (1885- 1978) on Feb. 17, 1904. Jeff King is buried in Big Crabtree Church Cemetery, Mitchell County. (a) Frank King (April 15, 1905- January 26, 1986) married Essie Tipton (1905- 1996), the daughter of Henry Tipton and Rebecca Murphy. Lived in Mitchell County. Buried at Big Crabtree Cemetery. (b) Estella Eva King (April 25, 1907- ) married Roy J. Young (1903- 1974) of Yancey County. (c) Fred Lee King (May 23, 1910- November 6, 2000) married Clara Bartlett. Lived at Estatoe, Mitchell County. Buried at Spruce Pine Memorial Cemetery. (d) Lee King (April 30, 1913- April 3, 1960) married Savannah Tipton, the sister of Essie Tipton. Buried at Big Crabtree Cemetery. (e) Ruby King (May 27, 1916- Sept. 28, 1999) married Tyson Buchanan. Lived in Mitchell County. Buried at Liberty Hill Cemetery. (f) Essie King (1918- 1921). Buried in Young Cemetery, Arbuckle. (g) Mae King, married Virgil Silvers. (Lives in Oak Ridge, TN). Jeff King and Minnie Grindstaff's marriage ended in divorce. Minnie had another daughter: Amy Lou (July 15, 1931- Feb. 11, 1993), married 1st) Herschel Buckner 2nd) Gene Ballard. Minnie's other husbands were Jim Sparks and Albert Woody, and she is buried at Liberty Hill. 7. JOHN S. KING (April 2, 1890- April 3, 1954) (Dates according to gravestone. Census data shows a birthdate of 1888.) Married Donna Buchanan. Buried in Pitman Cemetery, Avery County. Children include: Thelma Dolona King, b. Feb. 26, 1916; Eula Mae King, b. March 16, 1918; Cleo Josaphine King, b. Sept. 9, 1920; Jack King, b. April 3, 1923; Charles W. King, b. April 30, 1925; Erastus King, b. Sept. 23, 1927; John King, Jr, b. February 20, 1930; Mildred Jane King, b. October 30, 1933.